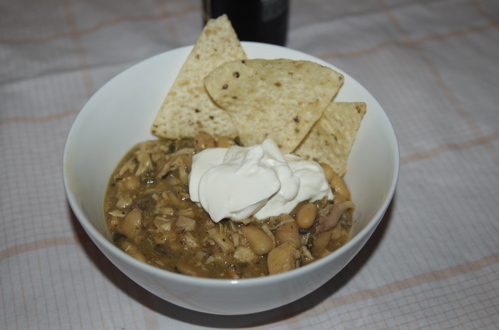 My wonderful husband, Eric, is taking the reins today to share the recipe for the scrumptious White Bean and Chicken Chili he made this weekend. It is perfect for these cooler nights. Enjoy! This chicken chili hits the spot on a cool evening. Debone the chicken. Season evenly on both sides with salt, pepper, adobo, sage, and basil. Reserve. Peel and rinse the tomatillos. Cut the smallest in half and the larger to roughly that size. Put in a medium saucepan, and add the cider vinegar and one beer. Bring to a boil, then simmer for 20 minutes or until the tomatillos soften. Roast the chiles and wrap in plastic to steam them, 15 minutes. Rub or peel off the skin, then remove the seed pits and dice. Heat the olive oil in a large pot to a shimmer. Add the chicken, skin side down, and brown. Remove before the chicken is cooked through, about 15 minutes. Drain on paper towel. To the pot, add half of the liquid cooked with the tomatillos and deglaze. Add the chiles and onion to the pot and sautée* with a pinch of salt. Once toasted, add the garlic and toast, stirring often 5 minutes. Add the tomatillos and liquid, then the cans of beans, with liquid. salt and pepper the beans before you stir them in. Add the other beer. Dice the chicken and return to the pot. Bring to a boil, then simmer for an hour. Taste frequently to correct the seasoning. Serve with white corn tortilla chips and a dollop of sour cream. * If you started with a whole chicken and have giblets, dice them and add them with the onions and chiles. Skip the kidneys and neck.